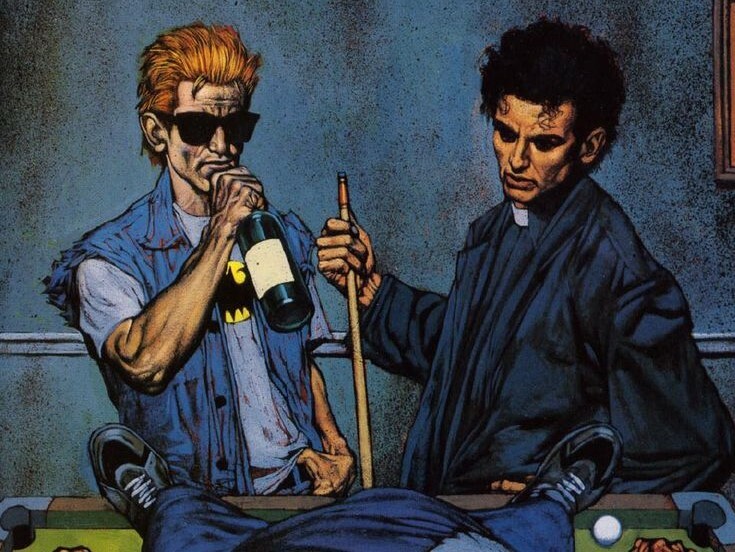 Preacher takes a bite out of the Big Apple in #5-7, and Jesse’s acting like a total tourist, popping in on the Statue of Liberty, the Empire State Building, and the Unluckiest Cop in the World. 3:13 – And Now for Something Completely Different, you may recall, is the title of Monty Python’s first film, named for a frequent interstitial in their previous sketch comedy series Monty Python’s Flying Circus, from which the sketches in the film were derived. 9:00 – Eric’s referring to a writer’s adage first put forth by Aristotle, that a probable impossibility is always preferable to an improbable possibility. It means that an audience is more likely to accept something impossible that feels plausible than something that they know to be possible, but highly unlikely. In Preacher, a society of angels with human urges and hangups is much easier to accept than the coincidence that the cops investigating the case our heroes are talking about happen to be on TV in the same room. 9:26 – Something we didn’t talk much about in the audio is how this arc satirizes our social reactions to and fictional portrayals of serial killers, which we’ll see more of a little later in this arc. 10:41 – Last week in Hellblazer, we met John Constantine’s old friend Ritchie, who used the cutting edge computers at the breakfast cereal factory where he worked to send his soul into the nascent internet. That was a 1988 issue; this one’s from 1995. 14:34 – That was an oblique reference to comedian Sean Cullen and his bit about why there will never be an Irish James Bond villain. 15:56 – The Purple Man is a Marvel Comics supervillain, created by Stan Lee and artist Joe Orlando for 1964’s Daredevil (vol. 1) #4. A former international spy doused with chemicals that gave him purple hair and skin and superpowered pheromones that compel obedience to his commands, Purple Man was recently restored to major villain status when Brian Michael Bendis used him in the origin story of his retired-superhero character Jessica Jones. He was memorably played with childlike petulance (and a more plausible skin tone) by David Tennant in Netflix’s Jessica Jones TV series. 19:27 – Catch Me If You Can is a 2002 film by Steven Spielberg dramatizing the life of con man Frank Abagnale, Jr. The film posits an annual Christmas call between Abagnale and Carl Hanratty, the FBI detective assigned to his case, Abagnale calling purportedly to taunt Hanratty, but in truth because he has no friends or family to talk to. 31:02 – This might be the first mention of Cassidy’s heroin habit, which will become a much more significant plot point in a couple of arcs. 33:16 – Incidentally, Christopher Street is a real place, and really was the center of New York City’s gay culture in the 1970s and 80s. By the time of this comic, the center of gay life in the city had shifted as a result of the AIDS epidemic, though the gay magazine Christopher Street was still published until December 1995. The street is the home of the Stonewall Inn, site of the 1969 police raid that sparked the Stonewall riots. 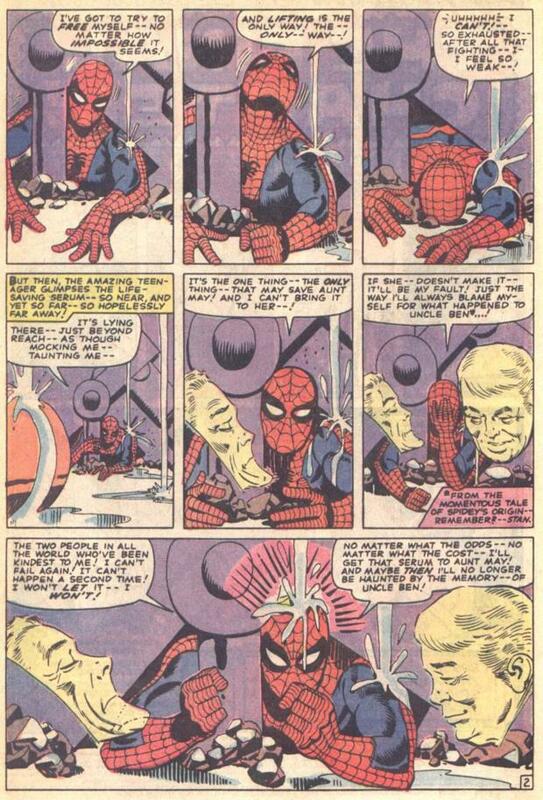 41:53 – The sequence in question comes from the classic Amazing Spider-Man #33. 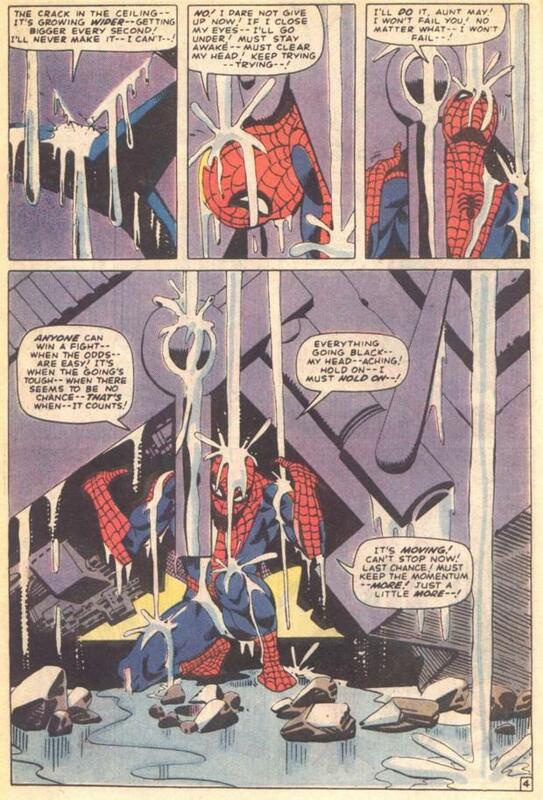 After a confrontation with the Master Planner (who’s really Doc Ock in disguise) results in the villain’s lab collapsing atop Spider-Man, Spidey has to throw off the tons of machinery in an iconic four-page sequence. 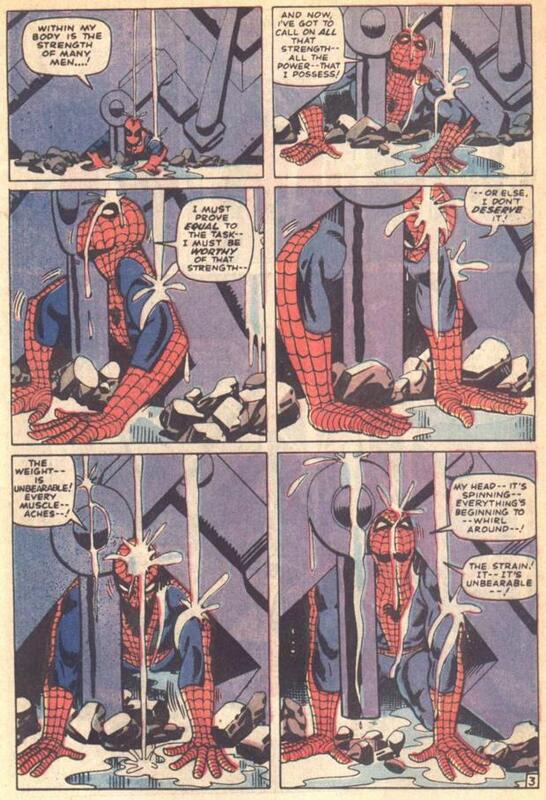 This scene has been homaged and reimagined many times in subsequent Spider-Man lore. One likely example is the moment at the end of Spider-Man 2 when the wall-crawler must lift a wall of Doc Ock’s collapsing warehouse to save Mary Jane. 1:00:54 – The artist on Locke & Key was Mr. Gabriel Rodriguez. 1:00:57 – Indeed, Locke & Key writer Joe Hill is Stephen King’s son. 1:03:19 – I realize I’m asking for the big mystery of the series to be revealed in the first issue! What I meant was more that our compromised viewpoint character seemed to be getting in the way.